This is the electrifying dystopian love story, the first in the trilogy by bestselling authors Giovanna and Tom Fletcher. Eve is like any other teenage girl . . . Except that the fate of the entire world lies on her shoulders. She's the first girl born in fifty years. She's the answer to their prayers. Which means she has one function alone . . .
At sixteen, Eve must face her destiny and make a choice. She will choose a man, one out of three carefully selected suitors. The future of the planet hangs on Eve making the right choice. COULD YOU CHOOSE BETWEEN LOVE, AND THE FUTURE OF THE HUMAN RACE? Tom Fletcher is one of the UK's bestselling authors for children. He is the creator of The Christmasaurus, which was the biggest debut middle-grade novel of 2016, as well as being one half of the duo behind the Dinosaur That Pooped picture book series, which has sold over a million copies. Tom is also a musician, Guinness World Record holder and vlogger. His YouTube channel has had almost 100 million video views and 630 thousand subscribers. Tom's books have been translated into thirty-one languages and his most recent is called There's A Dragon in Your Book. Essex-born Giovanna is an actress, blogger, vlogger and presenter. She is married to Tom Fletcher from McFly/McBusted and is mum to their two boys Buzz and Buddy. She lives in Middlesex with her family and is a patron of CoppaFeel! as well as a Number One Sunday Times bestselling author. 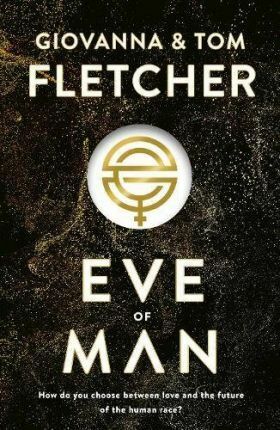 Together with her husband, she wrote the Sunday Times bestselling novel Eve of Man.